Environ Skincare is a cosmeceutical range that is built on advanced facials, skin care products and nutritional care. Developed by Dr. Des Fernandes, a respected South African plastic surgeon, to repair damaged skin, replenish essential nutrients and increase collagen and elastin production. His concern about the increasing incidence of skin cancer led him to research the most effective ingredients to protect healthy skin at an early age and to treat the increasing problems associated with photo-damaged skin. For optimum skin health Environ believe that vitamin A is the key ingredient. Environs unique step up system helps the skin to acclimatise gradually to the increasing levels of vitamin A, thus reducing the likelihood of a skin reaction. Environ homecare and professional skincare is results driven, the range uses high concentrations of absorbable fresh vitamins A, C, E and beta-carotene address a wide range of concerns such as photo ageing, fine lines, wrinkles, acne or problematic skin, pigmentation, uneven skin tone, scarring & sun damage. The Environ philosophy is that by protecting our skin from UV rays, pollution, bad diet and stress we can prevent premature ageing and maintain a healthy, beautiful skin for a lifetime. Environ normalises skin, by utilising high doses of Vitamins A, C, E and Beta Carotene applied topically, providing skincare to prevent and to treat photo-damage, problem skin, pigmentation and scarring and is suitable for children, men and women. 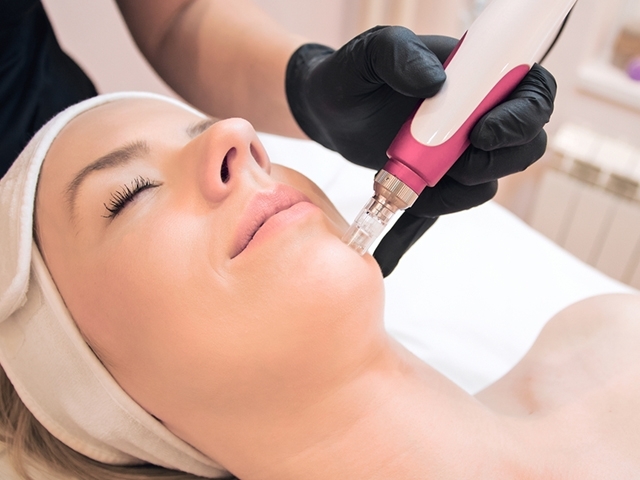 A one hour Environ treatment using the Ionzyme machine is equivalent to 77 hours of manual facials!! The Environ Cool Peel makes your skin instantly brighter, cleaner and more light reflective.